With the right strategy and tools in place, enterprises can reduce the disruption of software audits and negotiate new contracts from a position of strength. Software licensing has never been easy to manage, but constantly changing business needs and more complex contract terms are making the challenge tougher than ever. And casting a shadow over everything is the threat of a software audit, which lawyers and industry experts agree is a serious concern for software users in every sector. Fortunately, it’s possible not only to mitigate disruption, but also to deliver even larger benefits in the process — such as reducing overall software costs and optimizing IT assets throughout an organization. The key is to rethink software renewals by seeing them as an opportunity to negotiate more effective contracts with software vendors. Done right, these agreements help software buyers get the IT resources they need to run their growing organizations, while garnering terms that keep costs as low as possible. But an effective renewal strategy requires upfront planning and sufficient time for contract negotiations. “It’s better to be proactive and manage costs on an ongoing basis,” says Amy Konary, research vice president for software licensing at IDC. The following five steps can help IT managers start the journey to more effective software management. Software asset management (SAM) solutions create a foundation for success by giving organizations a clear picture of their current application environment and spending practices. This baseline information shows all the software being used within an organization, i.e., who is using each title and how often the applications are being accessed. The initial baseline assessment of software titles gives enterprises an opportunity to avoid noncompliance fines by closing any gaps between the applications being utilized and what is under license. “We frequently see people getting into trouble by not accurately managing their desktop software, especially the Microsoft Office suite,” Scott says. A compliance breakdown can occur when IT staff members use standard images to set up new computers. A particular user may be assigned a license for Office 2007, for example, but the standard image mistakenly installs the 2010 edition on the user’s computer. If this mistake is not found until there’s an audit, the organization may be liable to purchase new licenses for all noncompliant systems. Baseline assessments can deliver a gold mine of additional data. For example, the list of titles often can be an eye-opener, such as when IT managers discover software they didn’t know they had. A common example of this so-called shadow IT is an independent staff subscription to applications through a Software-as-a-Service (SaaS) contract. This is a clear danger in the era of cloud computing and may lead to excessive costs from duplicate titles or ongoing subscription payments, even when a SaaS application is no longer being used. The discovery tools within the best SAM programs can detail the full on-premises and cloud software portfolio so organizations can centrally manage the entire environment. But baselines are just the start. 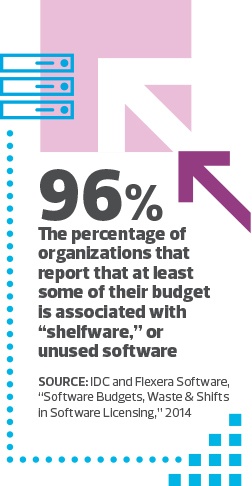 By showing IT managers how frequently individual software titles are being used, planners can eliminate obsolete shelfware. “Customers are good at upgrading or moving to new products, but they often forget to go back and uninstall software that’s no longer being used,” says Ursula Rakowski, a licensing account executive at CDW. To reap these benefits, organizations should implement a modern SAM tool that can create a central repository with essential information, such as licensed titles, copies of all contracts, service-level agreements (SLAs), proofs of purchase, departmental allocations and warranties. For example, Snow Software offers a suite of products for inventorying and managing licenses across multiple platforms. In addition, Snow solutions can meter usage rates to help organizations eliminate shelfware and find additional opportunities for optimization. At regular intervals — often biannually or annually — IT departments should perform audits that focus on changes to the environment since the baseline review was completed, and then remediate any new gaps, which simplifies auditing going forward. The numbers of licensed users and expiration dates aren’t the only factors to manage closely. Each contract will have its own SLA and associated components, such as training vouchers and e-learning resources for users, discounts for vendor implementation services and help desk support. Organizations won’t see the full value of their software investments if they don’t track these add-ons accurately. Overseeing these supplemental services requires both tools and a dedicated team. SAM tools can help by establishing a central repository of contract terms. This ensures that everyone in an organization who needs this information can quickly access it, rather than relying on someone’s memory or cryptic notes to see what services each vendor has promised. In addition, enterprises should also dedicate a person or a team of professionals to oversee contracts and supplemental services. “Companies that manage software effectively assign people to be a central source of information and proactively manage software resources,” Konary says. Legal experts say that the team should represent or at least consult with specialists from outside the organization’s IT department. “The idea of basic checks and balances suggests that organizations need a variety of people managing agreements, including representatives from compliance, procurement, finance and legal areas,” Scott says. To optimize their software deployments, IT departments must identify the total cost of ownership (TCO) of their applications by using the asset inventory information gathered with SAM tools. Key questions to ask include: How much is the organization currently spending on application services? How much will these services cost in the future? And what budget controls can be implemented to reduce expenses? But experts caution that TCO calculations are complex and must encompass a range of factors beyond just license costs. These include related expenses for IT administration, power, cooling and hardware. For this reason, once enterprises have a solid SAM foundation in place, they should extend their asset management efforts to bring greater control over the entire IT infrastructure, says Adams. “Expand beyond software management to track and maintain all assets across your environment,” she advises. Leading ITAM tools can automatically track and update information about leases, warranties and contracts for hardware as well as for software, she adds. Once identified, the licenses may be recovered, not only to reduce software spending on new licenses, but also to potentially reduce annual maintenance costs. To spot underutilized licenses, organizations should check for software that hasn’t been used within the past 90 days and then determine which specific titles should be reassigned. Note that not all contracts allow for reharvesting, so the SAM team must review their records before making any final decisions about particular programs. Once reharvesting policies are defined, the best SAM tools can automate the redeployment process. Many organizations benefit from volume license agreements, which, under the right conditions, offer advantageous pricing for buyers, thanks to the vendor’s willingness to tailor the contract to an enterprise’s size and industry sector. Volume agreements may simplify purchases of both on-premises software and cloud services. In addition, vendors may include other benefits, including pricing discounts on related products and services, product support and cloud management. But volume agreements aren’t the only choice. Other options include perpetual licenses, which become capital assets that organizations own and which depreciate over time. “You’d typically also purchase a maintenance contract, which gives you patches, sometimes updates and upgrades over time,” Konary says. A similar capital asset approach is to negotiate a term license, which assigns rights to software for a specific period, such as five years. The preset end date means organizations will pay less than they would for a perpetual license, which can be an advantage if executives believe changes in the organization or market will make the program obsolete in the future. Subscription licenses, such as SaaS agreements, have a set duration, often one to three years, and include software updates and maintenance as part of the agreement. Rather than drawing from capital budgets, organizations pay for subscriptions from operating budgets, an approach that avoids large upfront investments and in some cases precludes an extended approval process. “All of these licensing models have evolved to serve certain types of businesses, so the key is to decide which fits best for your organization,” Scott says. To make these decisions, many buyers engage outside experts who can provide an independent analysis of the enterprise’s needs, highlight the pros and cons of various options and compare costs over time. For example, CDW’s total software management services will assess a client’s environment and recommend licensing options based on its goals. The concern is clear, because even if an organization is in full compliance, it’s burdened with gathering information about current contracts and the prevailing usage rates among users. This often means pulling skilled IT personnel from more strategic projects and instead devoting them to weeks of tracking down software invoices and other tasks. The alternative is to closely manage software assets on an ongoing basis with the help of a comprehensive software asset management solution from vendors such as LANDESK or Snow Software.